Forget AMD, Intel, NVIDIA! Thomas White's incredible work with Neo FreeRunner's puny graphics dec...accelerator, Smedia Glamo 3362 is starting to bear fruits. Not listening to such comments as ”the chip will never be used anywhere else” and ”why not spend your time doing something more relevant”, he has chosen to actually do what he likes and sees as an interesting challenge. And that's often the spirit of free software, so I don't really agree with the naysayers. The camera shot on the right, running KMS-enabled X.org driver for the glamo chip on my Debian installation (visible software matchbox-window-manager, fbpanel, zhone), is a bit optimistic looking since Zhone happens to draw correctly. A lot of the drawing is not yet synced correctly, which shows as all text and images in eg. GTK applications being garbled. But as little as two days ago one couldn't yet much launch applications without X crashing, so the newest commits by Thomas were a big step forwards. I'm using Debian, and he's not, so I try to find time to help in debugging even though I really can't much help with the driver code. The driver is not just one piece of code, but consists of a kernel drm driver (direct rendering manager) using GEM, libdrm support for the kernel driver and finally the X.org driver supporting these other components and offering buzz-words like DRI2. There is also a beginning of a Mesa 3D driver, though it is so far just a skeleton driver since the 2D/KMS/EXA/DRM parts are what should be done first before dwelling into the OpenGL realm. Openmoko the company is basically nowadays just producing new Neo FreeRunners to resellers, but the community of the so far only Free phone is thriving. 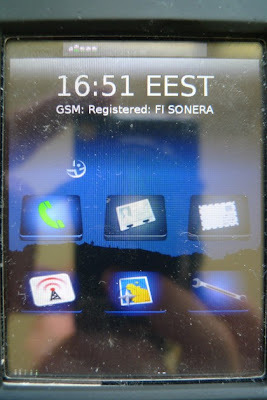 The final (Openmoko produced, from where gta02-core continues) version of the phone, with the famous buzzing problem fixed, appeared on store shelves some time ago, offering better out-of-the-box phone functionality in addition to all the ”mini computer” features. It was also offered to Debconf visitors on discount. It's not only cool to have kernel mode-setting, though it is indeed very cool as well. The reason for much sorrow in the whole OM project has been the graphics chip, and some of the problems with the chip are only finally solvable with the kernel doing the mode-setting. So it's both a very modern thing to use KMS, but there are also clear potential benefits of having accurate control over this very ”sensitive” piece of silicon. The current non-KMS X.org driver for example busy loops in order to try to feed the chip at a correct pace, causing CPU usage every time there is any drawing going on. This is somehow reminding me about getting the best out of 8-bit computers and other hardware with some specific limitations. The glamo chip is very limited in some ways, but also capable in some other ways like theoretically offering MPEG-4 decoding, OpenGL ES 3D support. It's a mixed bag of things, and I can very well imagine it's indeed an interesting challenge to work on it, if you just have the skills (I don't) and nerves (proper debugging tools help). (II) Glamo(0): RandR 1.2 enabled, ignore the following RandR disabled message. Wow. This really rocks. I'm looking forward to see the code stabilizing and being picked up by the distributions. Very, very cool. and you say the glamo has mp4 decoding hidden inside it? I'm so looking forward to this. If the Neo was a proprietary phone, there's no way these features, for an 'obsolete' chip, would have seen the light of day. P.S. Sent using my Neo!